Pre Engineered METLEX Buildings (PEB) revolutionized the construction market using built-ups in place of conventional Hot Rolled Sections. PEB is a METLEX structure built over a structural concept of primary members, secondary members, and the cover sheeting connected to each other. Pre Engineered METLEX Buildings can be fitted with different structural additions like trusses, mezzanine floors, fascias, canopies and crane systems as per user requirements. Backed by a diligent team of professionals, we have been able to offer Industrial Storage Shed. We manufacture these storage sheds by making use of best quality of material & modern techniques keeping in pace with industry norms. The storage sheds provided by us available on different specifications as per the needs of customers. We provide this storage sheds in a given time frame at affordable price. We are highly efficient in manufacturing, exporting, importing, distributing, wholesaling, trading and supplying a very sophisticated range of Industrial Sheds. Offered industrial shed is checked in terms of quality before delivering at customer’s end. 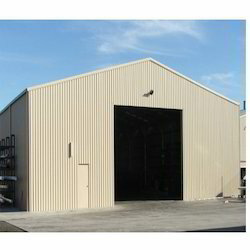 This industrial shed is manufactured from the high quality material & modern techniques, as per international quality norms. 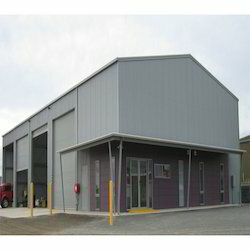 In addition, we provide this industrial shed on several specifications for meeting the variegated demand of customers. PU/PIR metal-face sandwich panels can be manufactured with the PU/PIR reaction mix is first laid down on one metal facing. During the expansion process, rigid polyurethane foam passes through a tacky phase, which enables it to form a strong bond with the facings.